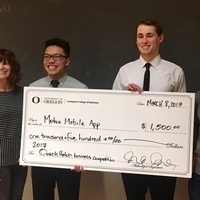 QuackHatch is an annual, cross-campus business idea competition open to University of Oregon undergraduate students of all majors. Pitch your business idea for a chance to win $3,000 in seed funding. Additionally, participating teams will be connected to resources and mentors that can help them advance their venture. Teams have gone on to receive additional funding, enter local business accelerators, and successfully launch and sustain their businesses after competing in QuackHatch. For more details including the application requirements, visit QuackHatch.com. Applications are due February 25, 2018. Sponsored by the Lundquist Center for Entrepreneurship and the Innovation and Entrepreneurship Club.